NailCanvas allows you to make nail art in a 3D space with decorations such as brilliant Rhine stones, glitter which look very realistic. You can change the viewpoint to enjoy your creation from different point of view. Do you sketch your new nail design using paper and pencil? With NailCanvas you can make your idea to the life. You can change color, decorations and visualize what you have in mind before you actually paint. This application isn't only for people who are fond of nail art but also for people who can't make nail art because of the nature of their jobs, or have never tried to make it at all can have this new experience with their iPhone and have fun. 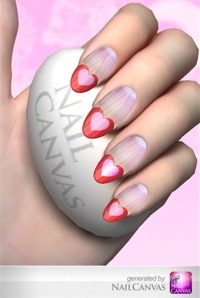 With NailCanvas you can save result as a picture to iPhone and share them on Twitter and Facebook. Next time let's do a nail art like this! I want a nail art like this! If you change the color it becomes like this! I hope NailCanvas will become a tool to help those who go to a nail art salon or do it by themselves, and also nail artists to show a real image of what they want to create. NailCanvas is a new-born application and we are still working to improve it everyday. So please send your thoughts, impressions and reviews on Facebook, Twitter or the following e-mail address. We post updates on Twitter and Facebook. 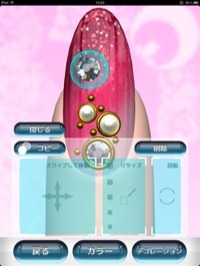 NailCanvas is a nail art simulator application using 3D realtime rendering computer graphic. It was first built as Windows application in 2009, but we rebuilt it as an iPhone application. We hope this application will be useful for all the people who like nail art.